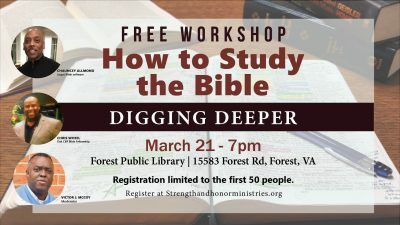 This workshop will give you the fundamental principles and tools to ignite your Bible study and help you to rightly divide the word of truth. The presenters include Joseph Allmond of LOGOS Bible software and Chris Wheel a Dallas Theological Seminary graduate and Executive Director of Outreach at Oak Cliff Bible Fellowship in Dallas, TX. Moderator will be bible teacher Victor J. McCoy.